Hurstville Council commissioned Environmental Partnership to support the Hurstville Masterplan planning framework with a Public Domain Plan. The purpose of the Public Domain Plan was to guide public domain improvements in the City Centre that would be enabled through a combination of private sector and council projects. The plan establishes a simple, elegant, robust and contemporary framework that can be staged and implemented over an ongoing programme. 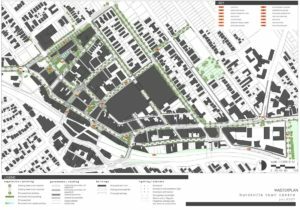 The Plan identifies a hierarchy of spaces including streets, public squares and parks, and pedestrian links. A framework of design and materials principles are established and applied through design concepts to the hierarchy and the key public spaces.